Ferrari Loophole exposed & how they did it. The odd side pods of Ferrari’s SF70H have been the eye catcher of many engineers in the paddock. Up until now none of them had a clue why they were shaped that way. Even the mighty Adrian Newey couldn’t explain them. It has been quite a while since we got a radical Ferrari in Formula One. But boy oh boy, this year they gave us one! Of course the new rules gave us more than one thing to speculate about, but none of them quite as exciting as those side pods and the air stream guide elements incorporated within. When we first saw the car from the front angle, the air inlets of the side pods hinted at something different. This car set apart from the others. The first pictures of the car didn’t even reveal that there were multiple elements. Ferrari’s promo pictures made it look as if the side pod was molded as one piece. Since last the test last week, we know have improved pictures revealing more than what met the eye the first time around. The pictures included in this article show us that the carbon part we thought were side pods actually aren’t. It is a structure made to regulate the airflow towards the real side pod. As you can see, the actual side pod is approximately 30 cm behind the carbon flap. What the front view did show us, was that the side pod entrance was rather unusually located high up. Of course, by now Ferrari’s rivals have figured out just what Ferrari’s design team were intending to do. Under the watching eye of Simone Resta the Italian team found a loophole in the regulations. Personally, this is why I love F1. Loopholes mean somewhere someone was smarter than the one who came up with the rule. The new regulations for 2017 promised us more aggressive looking cars than the year before. To that affect, the FIA incorporated rules about the V shape of the front wing, the way the end plates of the rear wing should “flow”, and under what angle the side pods should be. Paragraph 3.8.8 says that that angle should be 75 degrees. These rules are meant to give the cars a fast, aggressive look when viewed from above. These rules are for aesthetics rather than ideal performance. As a matter of fact, aerodynamic engineers hate the rule, if it was up to them they had gone for a rectangular design for the side pod. A side pod with a 90 degree angle would have a smoother air flow relationship between it and the various air splitters ahead. Further, the general airflow performance around them would be optimised wholesale. This is where the new loophole comes in. 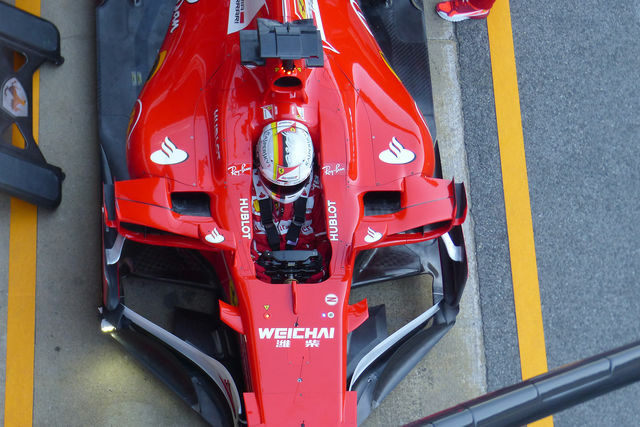 With the birds eye view, it’s clear to see how Ferrari made its actual side pod under a 90 degree angle. The carbon work in front (but still incorporated) of the side pod is set under a 75 degree angle, thus following the rules. 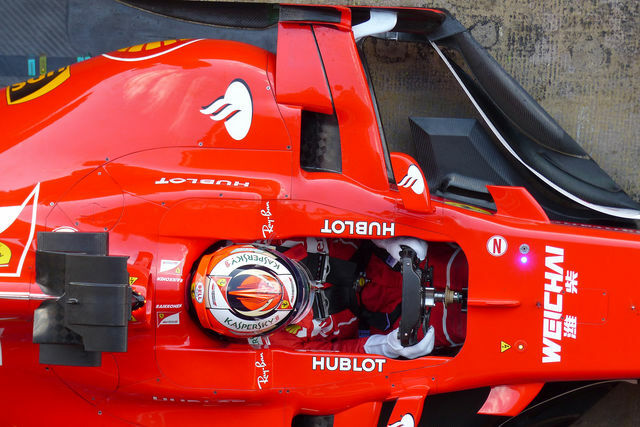 This enables Ferrari to make their side pod smaller than they appear on other cars. And it gives them more room between the barge boards and the actual air intake of the side pod. All this should be able to generate a better airflow towards them. To conclude, the Ferrari SF70H is a truly remarkable piece of engineering and certainly looks like it could be a true front runner this year.